As we continue our journey through the Old Testament, it's important to realise that this isn't just an exercise in us getting to know all of the different stories and being able to put them in the right order. What's much more important is that we grasp the big themes which lie behind the stories, and understand how they apply to our lives. We don't want to be like the Pharisees, who knew the Old Testament back to front, and much of it off by heart, but totally misunderstood Jesus when he turned up on the scene. Instead we want to find Jesus in and through the Old Testament. 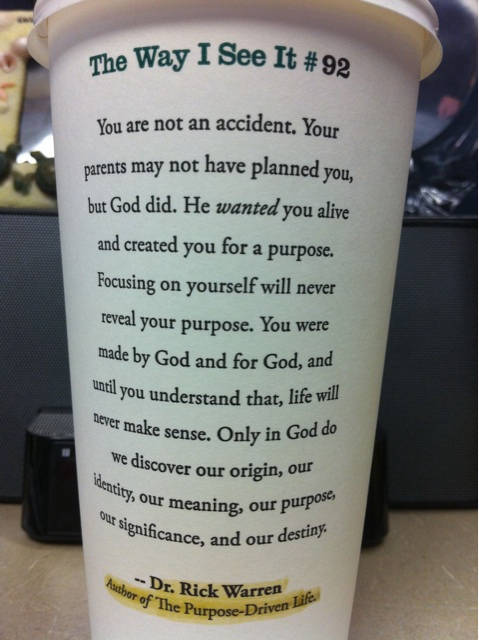 I was reminded of that this week when I saw a picture of a Starbucks cup, with a message on it from Rick Warren. In the first week of the series, as we looked at Genesis 1 and 2, the big theme was that God is a community (the trinity), and that he created us so that we could join and be part of his community, and bring glory to him. Until we grasp that we'll never understand why we're here on planet earth, and what the meaning and purpose of our lives is. 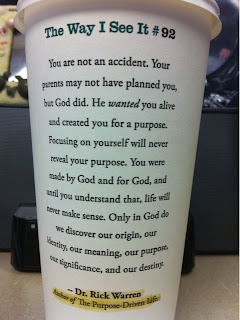 I thought Rick Warren captured that magnificently in his quote on the cup - see what you think! It goes to show you what can happen when you get an idea and act on it: God shows up! I wonder if he ever thought that Starbucks would be behind him. Would have loved to have been the fly on the wall with THAT meeting!